Several Chief Justices have in the recent past said negligible budgetary allocation is grossly inadequate to meet the requirements of the judiciary such as setting up of new courts and to improve infrastructure to bring down the pendency from a staggering 3.3 crore cases. Union budget 2017-18 presented by Finance Minister Arun Jaitley yesterday has earmarked just Rs 1,744.13 crore for the administration of justice including justice delivery, legal reforms, development of infrastructural facilities and autonomous bodies associated with legal matters and education. This is less than one per cent of the total budget of Rs 21.47 lakh crore -- for a judiciary which is burdened with a backlog of over three crore cases. The allocation has always been an average 0.4 % of the total budget. For the National Mission for Justice Delivery and Legal Reforms that includes Action Research and Studies on Judicial Reforms, e-Courts Phase II, Strengthening of Access to Justice in India (SAJI) the budgetary allocation is Rs 432.50 crore which is up by Rs 52.60 crore from Rs 379.90 crore earmarked in revised budget estimates for 2016-17. The Strengthening of Access to Justice in India is supported by the United Nations Development Project and the allocation for it is used for implementing a project on access to justice for marginalised people by the Department of Justice. Allocation for the autonomous institutions -- International Centre for Alternative Dispute Resolution (ICADR), National Judicial Academy, National Legal Services Authority, Indian Law Institute (ILI), Institute of Constitutional and Parliamentary Studies (ICPS) -- is Rs 118.03 crore that is up by Rs 17.35 crore. The Infrastructure Facilities for Judiciary has witnessed an allocation of Rs 629.21 crore -- an increase of Rs 85.45 crore over the allocation of Rs 543.76 crore in the revised budget estimates for the year 2016-17. The allocations under the Infrastructure Facilities for Judiciary are used for providing grants/assistance for the development of infrastructure in the states, union territories and the northeastern region and Sikkim under the centrally sponsored schemes and Gram Nyayalayas. While allocation for the development of infrastructure facilities for the judiciary in the states, union territories and the northeastern region and Sikkim stands at Rs 621.21 crore -- up by Rs 82.45 crore -- over the last year's revised allocation of Rs 538.76 crore, the allocation for Gram Nyayalayas -- justice at doorsteps -- is Rs 8 crore -- up by Rs 3 crore -- over Rs 5 crore earmarked in the revised budget estimates for the year 2016-17. While the allocation for National Legal Services Authority in revised estimates for 2016-17 was Rs 83.95 crore, the allocation for 2017-18 is Rs 100 crore. The hike in the administration of justice is Rs 82.76 crore. The allocation for the year 2017-18 is Rs 564.21 crore compared to the revised estimates of Rs 481.63 crore for the year 2016-17. Allocations under the Action Research and Studies on Judicial Reforms are used for extending financial assistance to the institutions working in the field of justice delivery, legal education and research and judicial reforms. 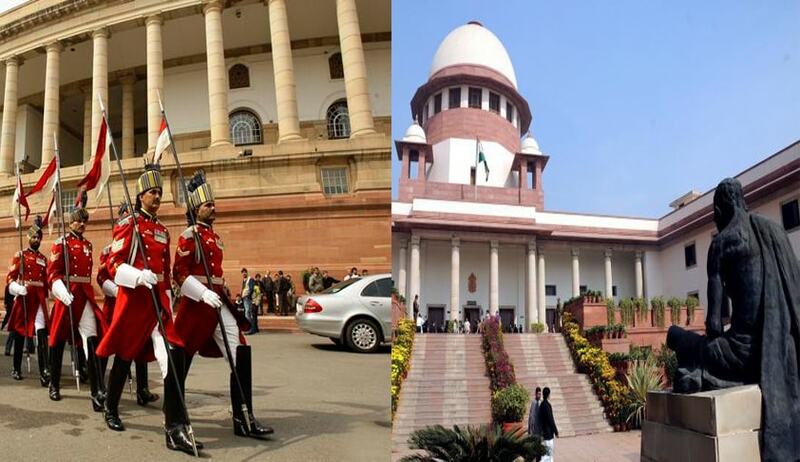 The budget has earmarked Rs 247 crore for the establishment expenditure of the Supreme Court of India which is up by Rs 5 crore over Rs 242 crore in the revised budget estimates for the financial year 2016-17. "Things can only look up if the Centre enhanced the budgetary allocation for judiciary from the negligible 0.4 per cent-0.11 per cent as being witnessed over the past decade which is grossly inadequate to set up more courts improve infrastructure in existing ones. Lodha's predecessor P. Sathasivam had in his farewell speech said "Budget allocation for judiciary is a serious concern. In so far as the Supreme Court is concerned, the government is not providing sufficient budget and, time and again, the Chief Justice has to intervene to seek sufficient allocation of Budget." Given the growing need of funds, legal experts have been supporting the idea of a national Budget for judiciary mooted in 2010 by then chief justice S.H. Kapadia. He had suggested that the judiciary must be allowed to use three major source of funds from within - court fees, fines imposed in criminal courts and costs imposed by courts which now goes to the government's coffers, for developing judicial infrastructure. These issues are still pending.